During this Dharma Vanishing Era, our world has been adversely endangered with its experience of drastic changes, unpredictable weather, widespread epidemics, overwhelming difficult diseases, and wrongful karmic acts committed by immoral people. To resolve the human health crisis, the compassionate Holy Master Ziguang Shang Shi will globally impart a series of ancient and unsurpassed Guang Huan Mi Zong Great Perfection Esoteric Dharma for the first time, including the One Day Zen, the Triple Heart Zen — the 4th Dimension Dharma, and more. 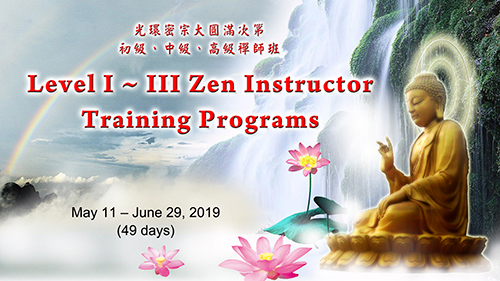 To expedite the development of GHMZ and train additional qualified Preachers, the honorable Holy Master will offer numerous training programs at the Holy Mountain Buddha Land, to impart the Nine Vehicle Great Perfection Dharma. This brilliant Dharma paves a successful path of cultivation for those seeking enlightenment. It also serves as an attainable, expeditious, reliable and the most direct path for liberating sentient beings from the sea of suffering, and enabling them to enter the Pure Land of Buddha Worlds. Different levels of GHMZ Great Perfection Dharma will be imparted in these programs. Outstanding and qualified students will be recommended to preach across the world. If the applicants have previously qualified from any Preachers/ Buddhist Instructor Training Program with certification granted, 50% of the tuition could be waived upon approval while meals and lodging will also be included. During this Dharma Vanishing Era, our world will experience drastic changes. The weather will become unpredictable and epidemics will be widespread, endangering our world. 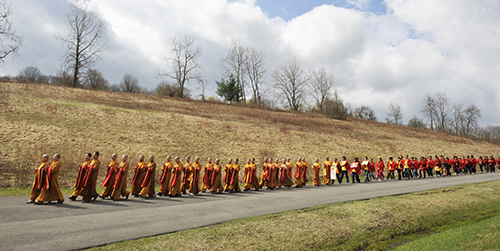 To resolve the human health crisis and develop the ability of students, disciples and preachers, the compassionate Holy Master Ziguang Shang Shi will impart the unsurpassed Esoteric Dharma to those in need at the Holy Mountain Buddha land. Program schedule: One Day Zen will be taught for free every Saturday. (1) Applicants must be GHMZ Converted Disciples and have learned Level III Esoteric Dharma. (2) Applicants must have visited Holy Mountain Buddha Land within the last three years. (3) No one will be allowed to join the class/program without prior approval. (1) Applicants must be converted students that have learned Level II Dharma. 2) Applicants must bring a copy of an internationally accredited physical exam record taken within the last 6 months. 3) Enrollment/Reception will take place at Peace Hall of Holy Mountain Buddha Land. 4) Luggage is limited to two bags per participant. 5) All applicants should be casually dressed; purified in body, mind, and soul; be respectful and follow all rules and regulations, as the GHMZ Holy Mountain Buddha Land is a sacred place for Arhans, Bodhisattvas and the Holy Land of Buddhist Dharma practitioners. During this Dharma Vanishing Era, our world will experience drastic changes. The weather will become unpredictable and epidemics will be widespread. To resolve the human health crisis, the compassionate Holy Master Ziguang Shang Shi will impart the unsurpassed Esoteric Beyond Three Vehicles Dharma, which helps to optimize the human genetic code, overcome a health crisis, attaining even more benefits for those in need. After undertaking over thirty years of practical experimentation, the Guang Huan Mi Zong Nine Vehicle Great Perfection Dharma has scientifically proven itself to be the best, most cost-effective and feasibly practical Zen method for solving the human health crisis. This Dharma, created by Holy Master Ziguang Shang Shi, exerts significant positive effects on numerous chronic health problems, such as heart disease, hypertension, diabetes, lung disease, hepatitis, gastrointestinal disease, cervical problems, herniated disc, arthritis, kidney disease, erectile dysfunction, migraine, obesity, allergies, sinusitis, acne, breast tumors, and more. International ambassadors from the United Nations Organization will be cordially invited to witness the amazing positive effects of GHMZ Health Dharma, which is dedicated to all of mankind. Note: Possible candidates should have learned the One Day Zen class and possess a recommendation from his/her GHMZ mentor. By learning Levels I and II of the Esoteric Dharma, practicing the “Retreat” and being sacredly empowered collectively in this program, one could experience significant relief from the effects of chronic disease. Program schedule will be updated later. 1) Deadline: Written application should be submitted 10 days before the start of the program. No one will be allowed to join the class/program without prior approval. 2) Applicants must bring a copy of an accredited physical exam record taken within the last 6 months. 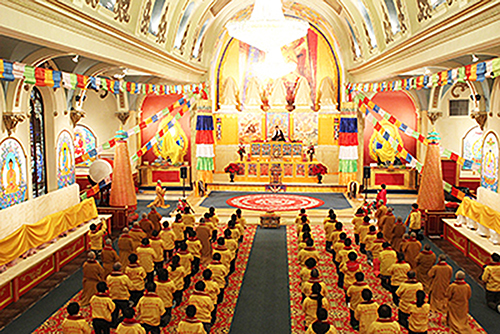 3) Enrollment /Reception will take place at Peace Hall and Holy Mountain Buddha Land.